Remember the essays you used to write as a student? You would browse through the indexes of books and journals until you came across a paragraph that looked relevant, and copied it out. If anything you found did not fit in with the theory you were proposing, you left it out. This, more or less, constitutes the methodology of the journalistic review—an overview of primary studies which have not been identified or analysed in a systematic (standardised and objective) way. 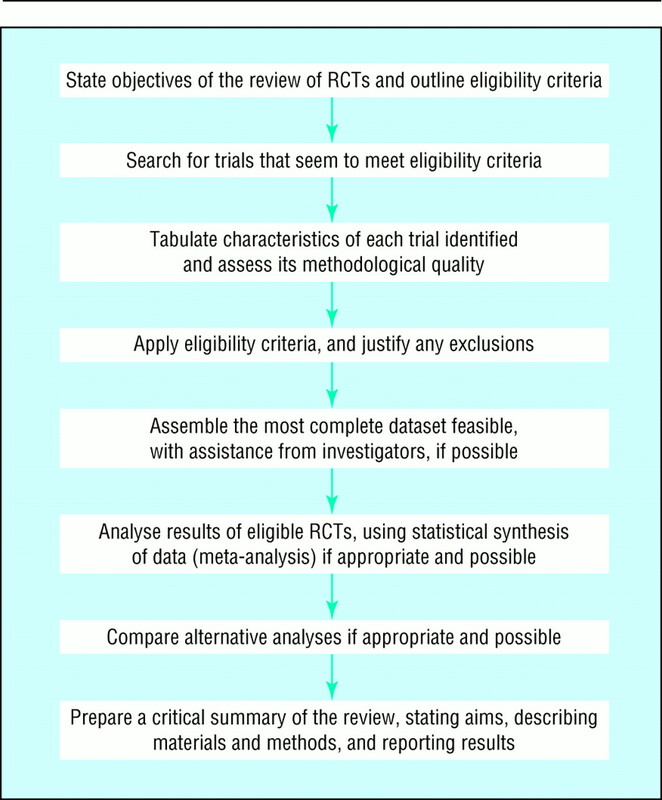 In contrast, a systematic review is an overview of primary studies which contains an explicit statement of objectives, materials, and methods and has been conducted according to explicit and reproducible methodology (fig 1). Many, if not most, medical review articles are still written in narrative or journalistic form. Professor Paul Knipschild has described how Nobel prize winning biochemist Linus Pauling used selective quotes from the medical literature to “prove” his theory that vitamin C helps you live longer and feel better.3 4 When Knipschild and his colleagues searched the literature systematically for evidence for and against this hypothesis they found that, although one or two trials did strongly suggest that vitamin C could prevent the onset of the common cold, there were far more studies which did not show any beneficial effect. Question 1: Can you find an important clinical question which the review addressed? Question 2: Was a thorough search done of the appropriate databases and were other potentially important sources explored? Even the best Medline search will miss important papers, for which the reviewer must approach other sources.9 Looking up references of references often yields useful articles not identified in the initial search,10 and an exploration of “grey literature” (box) may be particularly important for subjects outside the medical mainstream, such as physiotherapy or alternative medicine.11 Finally, particularly where a statistical synthesis of results (meta-analysis) is contemplated, it may be necessary to write and ask the authors of the primary studies for raw data on individual patients which was never included in the published review. Question 3: Was methodological quality assessed and the trials weighted accordingly? Question 4: How sensitive are the results to the way the review has been done? Carl Counsell and colleagues “proved” (in the Christmas 1994 issue of the BMJ) an entirely spurious relationship between the result of shaking a dice and the outcome of an acute stroke.16 They reported a series of artificial dice rolling experiments in which red, white, and green dice represented different therapies for acute stroke. Overall, the “trials” showed no significant benefit from the three therapies. However, the simulation of a number of perfectly plausible events in the process of meta-analysis—such as the exclusion of several of the “negative” trials through publication bias, a subgroup analysis which excluded data on red dice therapy (since, on looking back at the results, red dice appeared to be harmful), and other, essentially arbitrary, exclusions on the grounds of “methodological quality”—led to an apparently highly significant benefit of “dice therapy” in acute stroke. If these simulated results pertained to a genuine medical controversy, how would you spot these subtle biases? You need to work through the “what ifs”. What if the authors of the systematic review had changed the inclusion criteria? What if they had excluded unpublished studies? What if their “quality weightings” had been assigned differently? What if trials of lower methodological quality had been included (or excluded)? What if all the patients unaccounted for in a trial were assumed to have died (or been cured)? An exploration of what ifs is known as a sensitivity analysis. If you find that fiddling with the data in various ways makes little or no difference to the review's overall results, you can assume that the review's conclusions are relatively robust. If, however, the key findings disappear when any of the what ifs changes, the conclusions should be expressed far more cautiously and you should hesitate before changing your practice in the light of them. Question 5: Have the numerical results been interpreted with common sense and due regard to the broader aspects of the problem? Any numerical result, however precise, accurate, “significant,” or otherwise incontrovertible, must be placed in the context of the painfully simple and often frustratingly general question which the review addressed. The clinician must decide how (if at all) this numerical result, whether significant or not, should influence the care of an individual patient. A particularly important feature to consider when undertaking or appraising a systematic review is the external validity or relevance of the trials that are included. A good meta-analysis is often easier for the non-statistician to understand than the stack of primary research papers from which it was derived. In addition to synthesising the numerical data, part of the meta-analyst's job is to tabulate relevant information on the inclusion criteria, sample size, baseline patient characteristics, withdrawal rate, and results of primary and secondary end points of all the studies included. Although such tables are often visually daunting, they save you having to plough through the methods sections of each paper and compare one author's tabulated results with another author's pie chart or histogram. 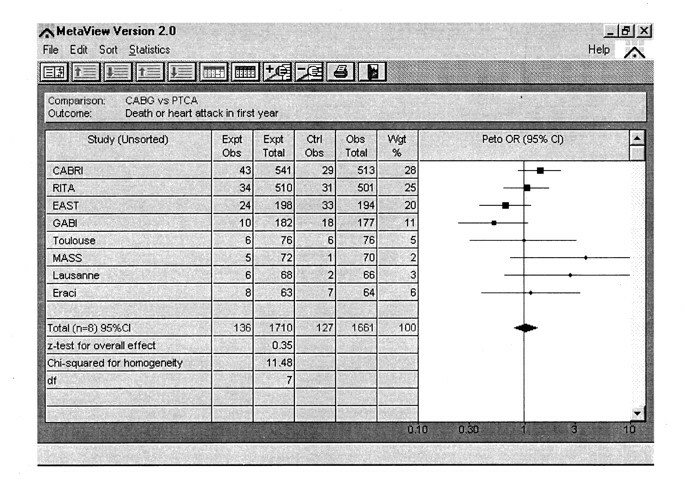 These days, the results of meta-analyses tend to be presented in a fairly standard form, such as is produced by the computer software MetaView.3 is a pictorial representation (colloquially known as a “forest plot”) of the pooled odds ratios of eight randomised controlled trials which each compared coronary artery bypass grafting with percutaneous coronary angioplasty in the treatment of severe angina.17 The primary (main) outcome in this meta-analysis was death or heart attack within one year. The horizontal line corresponding to each of the eight trials shows the relative risk of death or heart attack at one year in patients randomised to coronary angioplasty compared to patients randomised to bypass surgery. 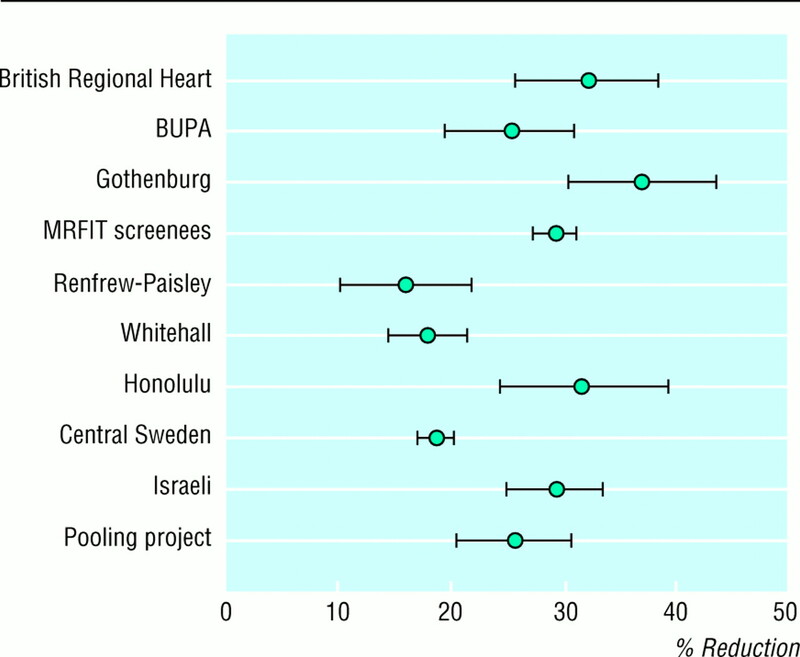 The “blob” in the middle of each line is the point estimate of the difference between the groups (the best single estimate of the benefit in lives saved by offering bypass surgery rather than coronary angioplasty), and the width of the line represents the 95% confidence interval of this estimate. The black line down the middle of the picture is known as the “line of no effect,” and in this case is associated with a relative risk of 1.0. If the confidence interval of the result (the horizontal line) crosses the line of no effect (the vertical line), that can mean either that there is no significant difference between the treatments or that the sample size was too small to allow us to be confident where the true result lies. The various individual studies give point estimates of the relative risk of coronary angioplasty compared with bypass surgery of between about 0.5 and 5.0, and the confidence intervals of some studies are so wide that they do not even fit on the graph. Now look at the tiny diamond below all the horizontal lines. This represents the pooled data from all eight trials (overall relative risk of coronary angioplasty compared with bypass surgery=1.08), with a new, much narrower, confidence interval of this relative risk (0.79 to 1.50). Since the diamond firmly overlaps the line of no effect, we can say that there is probably little to choose between the two treatments in terms of the primary end point (death or heart attack in the first year). Now, in this example, every one of the eight trials also suggested a non-significant effect, but in none of them was the sample size large enough for us to be confident in that negative result. Note, however, that this neat little diamond does not mean that you might as well offer coronary angioplasty rather than bypass surgery to every patient with angina. It has a much more limited meaning—that the average patient in the trials presented in this meta-analysis is equally likely to have met the primary outcome (death or myocardial infarction within a year), whichever of these two treatments they were randomised to receive. If you read the paper by Pocock and colleagues17 you would find important differences in the groups in terms of prevalence of angina and requirement for further operative intervention after the initial procedure. In the language of meta-analysis, homogeneity means that the results of each individual trial are mathematically compatible with the results of any of the others. Homogeneity can be estimated at a glance once the trial results have been presented in the format illustrated in figures 3 and 4. In 3 the lower confidence limit of every trial is below the upper confidence limit of all the others (that is, the horizontal lines all overlap to some extent). Statistically speaking, the trials are homogeneous. Conversely, in 4 some lines do not overlap at all. These trials may be said to be heterogeneous. The definitive test for heterogeneity involves a slightly more sophisticated statistical manoeuvre than holding a ruler up against the forest plot. The one most commonly used is a variant of the χ2 (chi square) test, since the question addressed is whether there is greater variation between the results of the trials than is compatible with the play of chance. Thompson18 offers the following rule of thumb: a χ2 statistic has, on average, a value equal to its degrees of freedom (in this case, the number of trials in the meta-analysis minus one), so a χ2 of 7.0 for a set of eight trials would provide no evidence of statistical heterogeneity. 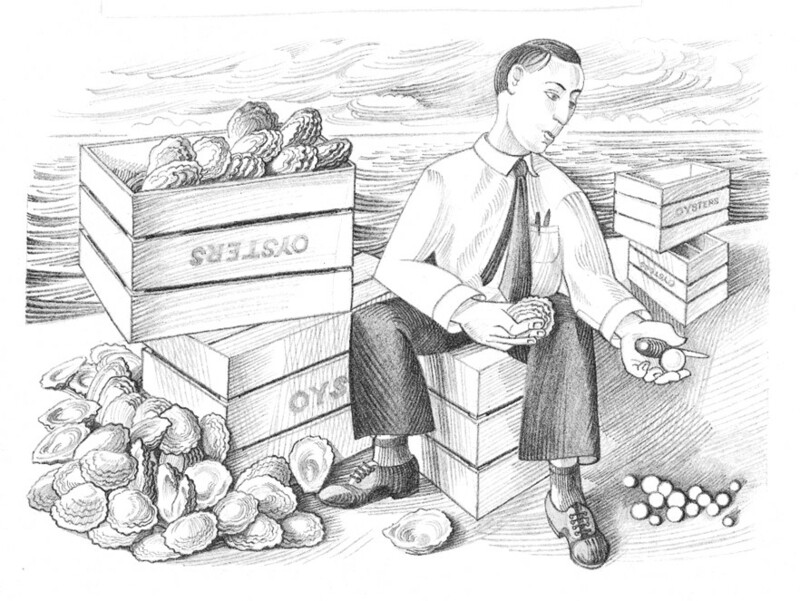 Note that showing statistical heterogeneity is a mathematical exercise and is the job of the statistician, but explaining this heterogeneity (looking for, and accounting for, clinical heterogeneity) is an interpretive exercise and requires imagination, common sense, and hands-on clinical or research experience. 4 shows the results of ten trials of cholesterol lowering strategies. The results are expressed as the percentage reduction in risk of heart disease associated with each reduction of 0.6 mmol/l in serum cholesterol concentration. From the horizontal lines which represent the 95% confidence intervals of each result it is clear, even without knowing the χ2 statistic of 127, that the trials are highly heterogeneous. Correcting the data for the age of the trial subjects reduced this value to 45. In other words, much of the “incompatibility” in the results of these trials can be explained by the fact that embarking on a strategy which successfully reduces your cholesterol level will be substantially more likely to prevent a heart attack if you are 45 than if you are 85. Clinical heterogeneity, essentially, is the grievance of Professor Hans Eysenck, who has constructed a vigorous and entertaining critique of the science of meta-analysis.19 In a world of lumpers and splitters, Eysenck is a splitter, and it offends his sense of the qualitative and the particular to combine the results of studies which were done on different populations in different places at different times and for different reasons. The articles in this series are excerpts from How to read a paper: the basics of evidence based medicine. The book includes chapters on searching the literature and implementing evidence based findings. It can be ordered from the BMJ Publishing Group: tel 0171 383 6185/6245; fax 0171 383 6662. Price £13.95 UK members, £14.95 non-members. Thanks to Professor Iain Chalmers for advice on this chapter. Cochrane CollaborationHandbook [updated 9 December 1996]. The Cochrane Collaboration; issue 1. Oxford: Update Software, 1997. .The Cochrane Collaboration: preparing, maintaining, and disseminating systematic reviews of the effects of health care.JAMA 1995;274:1935–8. , eds. Systematic reviews. London: BMJ Publishing Group, 1995. .How to live longer and feel better. New York: Freeman, 1986. .The science of reviewing research.Ann NY Acad Sci 1993;703: 125–31. .A comparison of results of meta-analyses of randomised controlled trials and recommendations of clinical experts.JAMA 1992;268: 240–8. .Searching the literature. In: How to read a paper. London: BMJ Publishing Group, 1997: 13–33. .Some examples of systematic reviews. In: Chalmers I, Altman DG.Systematic reviews. London: BMJ PublishingGroup, 1995: 9–16. .Searching for alternatives: loser pays. Lancet 1993;341: 1135–6. .An empirical study of the possible relation of treatment differences to quality scores in controlled randomized clinical trials.Controlled Clin Trials 1990;11: 339–52. .Assessing the quality of randomized controlled trials: current issues and future directions.IntJ Health Technol Assess 1996;12: 195–208. .The miracle of DICE therapy for acute stroke: fact or fictional product of subgroup analysis?BMJ 1994;309: 1677–81.
. Meta-analysis of randomised trials comparing coronary angioplasty with bypass surgery.Lancet 1995;346: 1184–9. .Why sources of heterogeneity in meta-analysis should be investigated. In:Chalmers I, Altman DG.Systematicreviews. London, BMJ Publishing Group, 1995: 48–63. .Problems with meta-analysis. In: Chalmers I, Altman DG.Systematic reviews. London: BMJ Publishing Group, 1995: 64–74. Magnesium, myocardial infarction, meta-analysis and mega-trials. Drug Ther Bull 1995;33: 25–7. .Misleading meta-analysis: lessons from “an effective, safe, simple” intervention that wasn't.BMJ 1995;310: 752–4.